Sending festive greeting cards on holidays is considered to be a cute and effective way of getting your personal message across to your loved ones. This interesting article lets you know how greeting cards became associated with Easter. Check it out to know about the fascinating history of Easter Greeting Cards. If you enjoy reading it, click here to share it with your dear ones. Wish you a happy Easter! The concept of greeting cards are said to have started with the ancient Egyptians who exchanged wishes in the form of personal notes on simple slips of papyrus. Similar traditions are believed to have been prevalent in Greece and China around the same time. All these were the precursors of the handmade paper greeting cards, which had become a more or less popular means of expressing good wishes by the early 13th century. The use of greeting cards really caught on in Europe when the postage stamp was introduced in 1840. It immediately turned the greeting card into a popular mode of sending personal messages and set off its commercial production on a mass scale. Greeting cards began to be created for a number of occassions like New Year's Day, Valentine's Day and Christmas. Easter was mainly seen as a religious occassion and the use of greeting cards was not much popular with the event until the late 1890s. Easter cards were literally born in Europe when a stationer in Victorian England added a greeting to a drawing of a rabbit. It gave birth to the modern Easter greeting card replete with symbols related to the occassion such as chickens, eggs, rabbits, cross and the like. The turn of the century saw the popularity of the Easter greeting cards. Those were the early days of Easter greetings and many of these were postcards, often featuring famous Easter symbols or even natural scenery and well-known buildings. The Easter greeting cards available in the U.S. at this time were the most interesting; these colorful pieces were lithographed and often embossed, sometimes with thin gold cutouts. 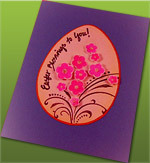 Today, greeting cards have become a popular medium to express wishes on Easter. According to American Greetings, Easter is now the fourth most popular holiday in terms of sending cards, ranking just behind Christmas, Valentine's Day and Mother's Day. Every year, the Easter season witnesses wide sales of greeting cards and it testifies to the spirit of brotherhood and friendship that exists in mankind despite occassional outbursts of strife and hatred.